The effects of creep grazing and stocking rate (SR) on forage selection and nutritive value of the diet selected by of Spanish does with Boer × Spanish kids and Boer × Spanish does with 3/4 Boer–1/4 Spanish kids were determined using grass/forb pastures. There were four treatments, each replicated, with three stocking rate (SR) treatments and one treatment involving creep grazing. 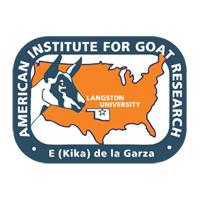 Goats of both types were equally represented in all treatments. Each group of does and kids was allocated to 0.4 ha pastures divided into four paddocks that were rotationally grazed in two cycles over a total of 76 days. The three SR were 4 does plus 8 kids (L), 6 does plus 12 kids (M), and 8 does plus 16 kids (H) per 0.4 ha pasture. The creep grazing treatment (C) was at the high SR relative to the pasture area common to the does and kids. In this treatment, however, the kids had access to an additional area of a similar 0.4 ha pasture sub-divided into four paddocks containing the leguminous tree mimosa (Albizia julibrissin Durazz) planted in rows. A direct observation and simulation method was used to characterize the diet selected by does and kids and obtain representative samples. These samples were evaluated in terms of their CP, NDF, ADF, and ADL concentrations and in vitro true DM digestibility (IVTDMD). There were no significant effects (P > 0.10) of stocking rate on botanical composition of the diet selected or its nutritive value. Does and kids selected diets of similar botanical composition and nutritive value for the three treatments without a creep area. When kids were in a creep grazing area, 52.8% of their diet consisted of mimosa leaves leading to an improvement in the overall nutritional value of the diet relative to times when in the base grass/forb pasture (CP 21.9 vs. 19.8%, NDF 34.1 vs. 53.8%, ADF 21.4 vs. 27.5%, and IVTDMD 85.7 vs.79.9%). It was concluded that stocking rate had no impact on diet selection and the nutritive value of the diet of does or kids when grazing forage of low to medium quality. Kids with access to creep areas including mimosa trees, however, preferentially consumed mimosa leaves, thus improving the nutritive value of their diet.